Welcome to the first 2018 monthly Pinterest Challenge Blog Hop, hosted by My Pinterventures. The purpose of this Pinterest Challenge is to motivate all the participants of this hop (and you too) to not just pin, but to make it happen! 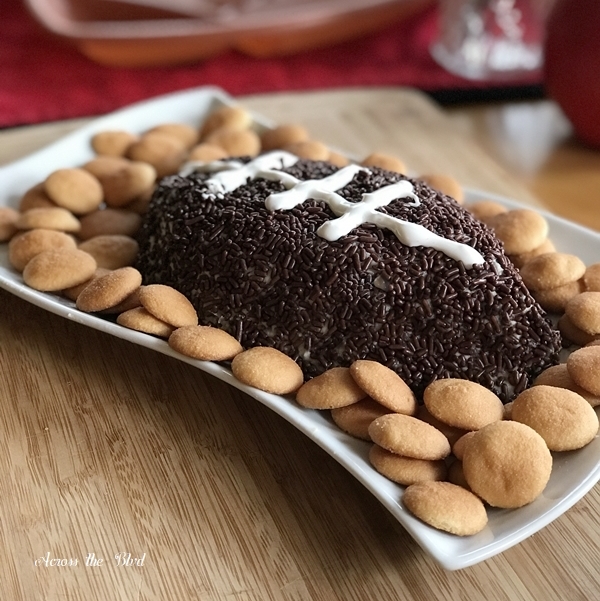 So this month, I chose to make a Cream Cheese Chocolate Chip Football Party Dip. My inspiration for this recipe was an eye catcher for me when I was searching on Pinterest for football party foods. I followed the recipe on Belle of the Kitchen with a couple of changes to suit our tastes. We hosted a National Championship Game party this year. The game was gut wrenching from our perspective. We were all pulling hard for Georgia to win. While the game didn’t turn out the way we had hoped, our party food buffet was a hit! 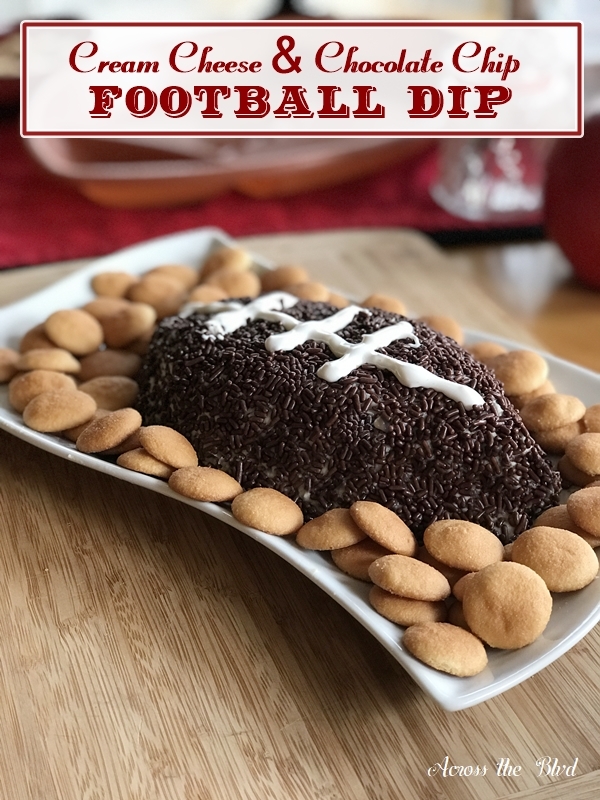 The Cream Cheese Chocolate Chip Football Party Dip was enjoyed by everyone. You can see when comparing the photos that I didn’t use chocolate chips for the coating. I used chocolate sprinkles instead. Also, I didn’t have any white chips on hand, so I used a Wilton’s White Decorating Icing Pouch for the laces. Making this was easy, but it does take a few hours to allow the ball to chill, so you’ll need to plan ahead if you make this. 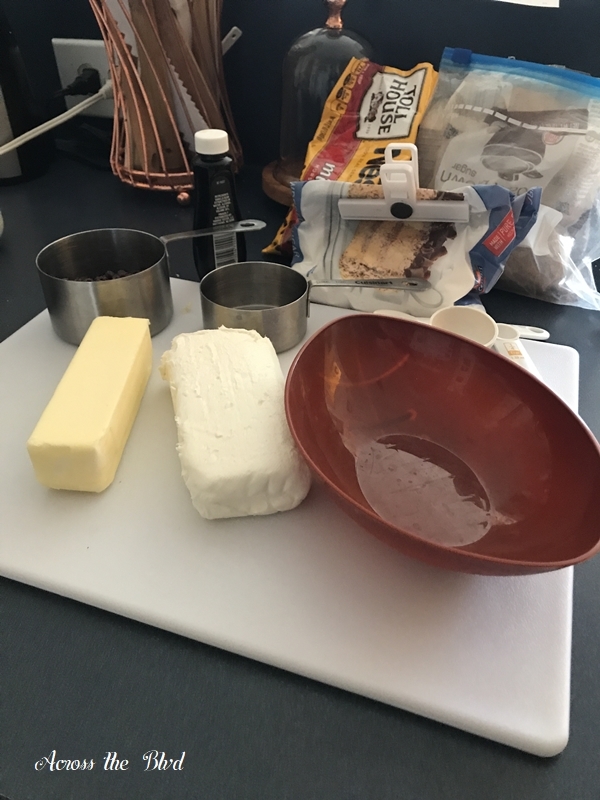 Combine cream cheese, butter, and vanilla in mixing bowl. Cream on medium speed with electric mixer. Add 1/2 of the powdered sugar and continuing beating on medium until blended. Add remaining powdered sugar and brown sugar and beat on medium until it's all combined. Stir in the mini chocolate chips with a spoon. 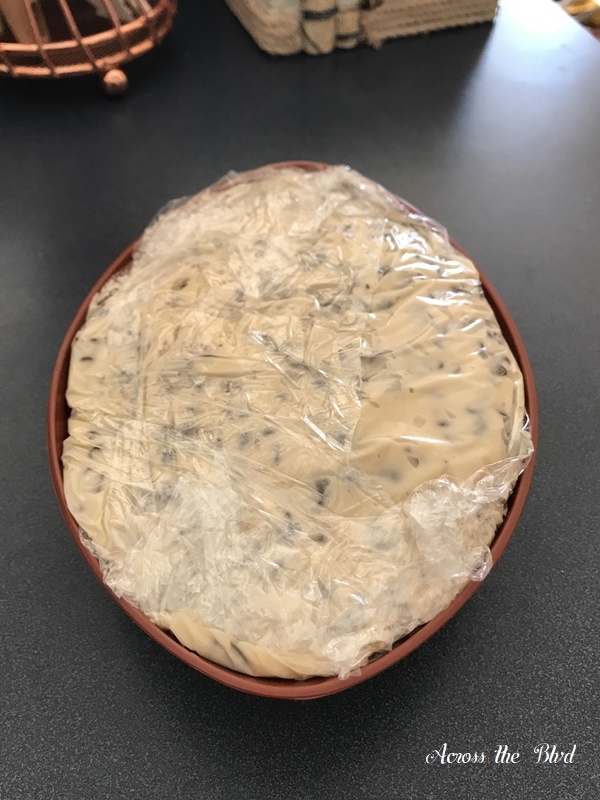 Cover with plastic wrap and refrigerate for two hours. Remove from refrigerator. To shape it into a football, use a small football bowl or shape by hand. Wrap in plastic wrap and chill for an additional hour. Remove from refrigerator and carefully uncover. If you used a bowl, turn it upside down and place ball on a serving tray. If you shaped it by hand, place the ball on serving tray. To decorate, place serving tray over a large bowl and generously sprinkle with chocolate sprinkles. Follow directions on decorating icing pouch and draw on the laces. Return to refrigerator until it's time to serve. Add mini Vanilla Wafers to the serving tray for dipping. After the mixture has been chilled for two hours, using a small football shaped bowl was an easy way to get the mixture to form the shape. This was a tip from the inspiration post. I found mine last year at the Dollar Tree. Place plastic wrap into the bowl with enough to cover the top of the dip and chill for an additional hour. After chilling, pull back the wrap and carefully lift the mixture from the bowl. Invert onto a serving tray and remove plastic wrap. Place the tray over a large bowl to catch the spills as you generously sprinkle with chocolate chips. Add laces by piping decorating icing on top. This is great served with Vanilla Wafers, but any cookie of your choice could be used. We’ll be sharing at lots of these great parties. Sam – Raggedy Bits • Lynne – My Family Thyme • Beverly – Across the Blvd. This is the perfect recipe for a football pary. I like the icing as the laces. I’ll have to give this recipe a try. It’s a delicious, dip. I hope you’ll like it, too. Thanks, Jenny! I like your take. I think the chocolate chips would have been a little too much, so i like the sprinkles better. 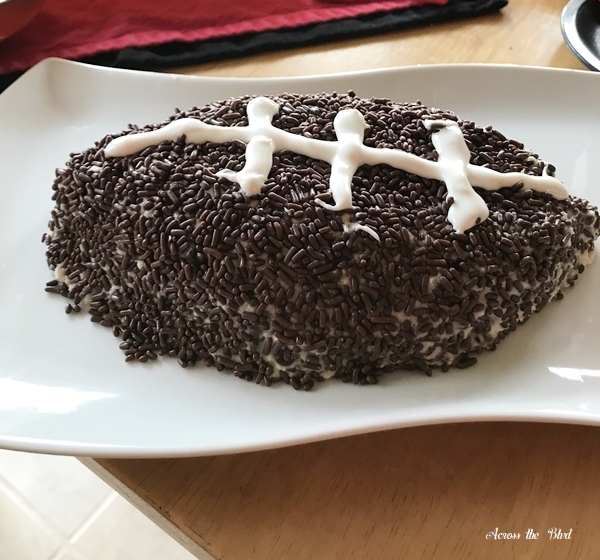 this tailgate treat might actually make me want to watch the big game. Thanks, Trisha. I thought for a dip, the sprinkles worked better, too. I plan on making this in just bowl without added the laces and having it year round. This was one Pinterest find that is a keeper. Anything with chocolate and cream cheese is a winner in my opinion. something tells me I could eat this all by myself. It looks so good. Thanks, I think so, too, Debra! It’s hard to go wrong with those ingredients! 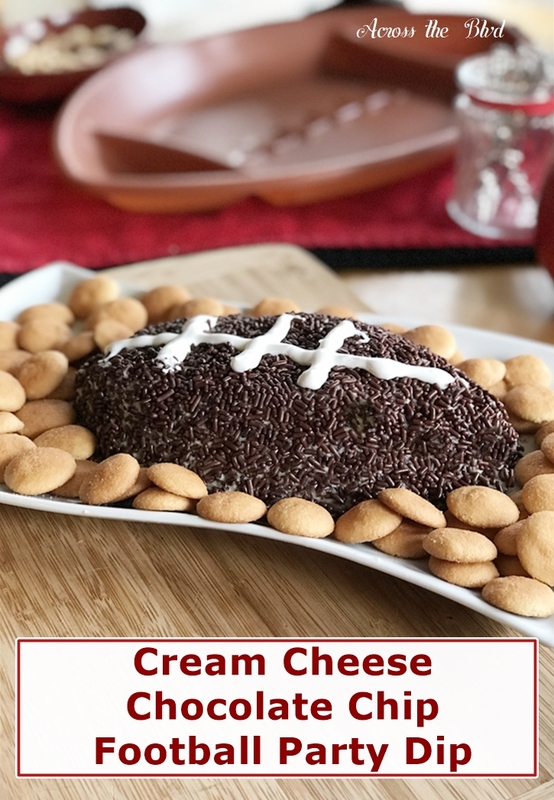 This would definitely make a great dip to take to a superbowl party! Love how yours turned out! Thanks, Roseann! I was pleased with the recipe and it was a hit! What a fun challenge this is. Looks delicious and perfect for game day! It was a fun challenge! You should sign up for February’s Challenge. The dip was delicious! And now I’m craving this dip…lol. It’s funny because I was just cruising pinterest a few days ago and I saw this pin. Definitely looks like something my family would enjoy. I’m ready to make it again! The pin was an eye catcher. How cute is this!! What a fun snack to enjoy on game day!! I’m sure it will be a big distraction to the game!! This looks amazing and so much fun! I know it would be a hit at any party! Thanks! It was a big hit for us! Thanks, Sam! We enjoyed it! That sounds so sweet and tasty! Pinned. Thank you! I appreciate the pin! This is adorable and it sounds delicious! Can’t wait to give it a try! thanks for the inspiration! Thanks, Gwen! I hope you’ll enjoy it! I like the idea (in a photo) of sefving pretzel with it. Sweet/salty. Love that combo and great for however the football score is heading. Thanks! I love the sweet and salty combination, too. I have been wanting a dip like this for super bowl Sunday. Now if I can shape up t as well as you did. This is a really delicious dip! I hope you’ll enjoy it. Using the plastic football bowl made shaping it easy. But, I think hand shaping it and covering it tightly with wrap would work, too. What a fun treat! Thanks for sharing at the what’s for dinner party. Have a fabulous week. Thank you, Helen! Thanks for the party. Hope you have a great week. very cute idea, and sounds quite appetizing! Thanks, Wendy. It was a tasty treat! I hope you’ll love it, too, Carrie! Thanks so much for the feature! I’ll look forward to coming by tomorrow! Ooh! I have no doubt that this was a huge hit at your party. I actually love that you used sprinkles instead of chocolate chips. I would imagine that makes it easy to dip into. Definitely going to surprise my family with this for Super Bowl! Thanks for the awesome recipe. I liked the sprinkles, too. It did make it easy for dipping. I hope you and your family will love it! I’m going to be making it again soon. What a fun and delicious idea! I pinned it under party ideas! Thank you, Julie! I appreciate the pin! Like the idea of using sprinkles. Sometimes for me, a massive amount of chocolate chips overwhelms other flavors. This does indeed look good. I’ve pinned for later use. For me, sweet treats wins my vote every time. Sorry your team didn’t win. Thank you, Florence! I liked the sprinkles, too. Thanks so much for the pin! Thanks so much for allowing me to share your recipe with my readers in my post – 12 TASTY GAME DAY RECIPES! You’re welcome, Dee and thanks for sharing it in your round up!